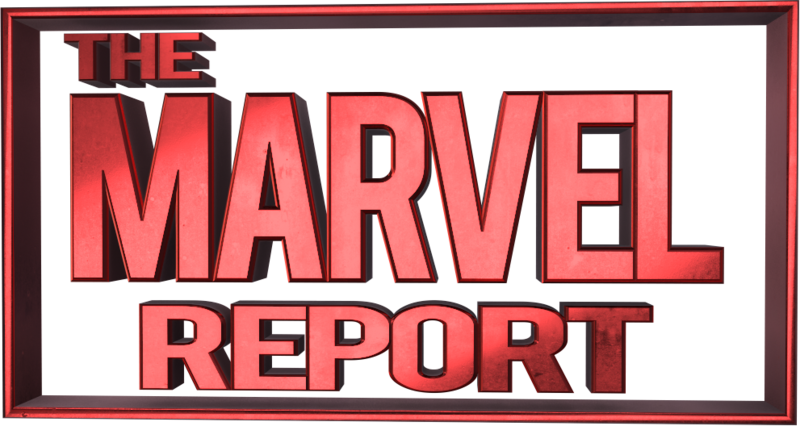 Here at The Marvel Report we pride ourselves on covering all things Marvel. We feature the latest trailers from Marvel Studios, reviews of your favorite Marvel TV shows, pictures of devoted fans partaking in some of the best cosplay you’ll ever see, and of course we cover the comic books. That is a lot of different aspects of fandom coming together under one banner, and it’s not expected that everyone participates in all aspects, but we are here to help if you want to try. Welcome to “Comics 101” where I, John Ernenputsch, will walk you through how to expand your love of Marvel into the comic book realm. For those of you that already read comics regularly this column isn’t aimed at you, although you are more than welcome to stick around. This is for the fan that would love to read comics, but doesn’t know where to start. The comic book world is is a big place that can seem intimidating, but it doesn’t have to be! Over the course of this column I will be walking you through some basic concepts. Some of the articles may be longer than others, but the plan is for them to always be informative. I’ll be starting out with the very basic concept of your options when it comes to how, and where you can buy comics. On May 2, 2008 the Marvel Universe went more mainstream than ever, with the release of the first Iron Man movie. Twelve films, five shorts, and four TV/Netflix shows later, the Marvel Cinematic Universe is the biggest franchise in entertainment today. As you all know, the characters started off in comic books, and comics featuring the most popular characters in the world continue to be published on Wednesdays, each and every week. While the movies have helped the comic book industry out over the past eight years, it hasn’t been as big of a boon as one would think. I’ll spare the numbers for now, but odds are that many fans of this website don’t read the comic books. My goal with this article isn’t to convince you to read the comics, but to make sure you have all the tools at your disposal to do so, if you’d like. With Marvel recently relaunching their entire line of comic books with new first issues, and new stories, there is no better time than the present to be a fan of Marvel Comics. When it comes to buying/reading comics, there are more options than ever before, and this article will be covering three of the biggest ways to get started. Local comic book stores/shops have been the backbone of the industry over the past four decades. Affectionately referred to as their “LCS” by fans, these are the small business in your neighborhood that make sure comic fans get their fix every week. To many, their LCS is a place of community where fans gather to discuss the latest news, and become friends with like minded individuals. However, it’s undeniable that some comic book stores are better than the next. It is important to the overall comic experience to find a LCS that makes you feel like you belong. This day and age it is inexcusable for anybody to feel unwelcome while shopping for comics (or anything really), and there are so many more good stores than there are bad ones. If you have a poor experience, the shop that may end up feeling like home might happen to be just down the street. What’s the easiest way to find a comic book store? There is a great tool called Comic Shop Locator. 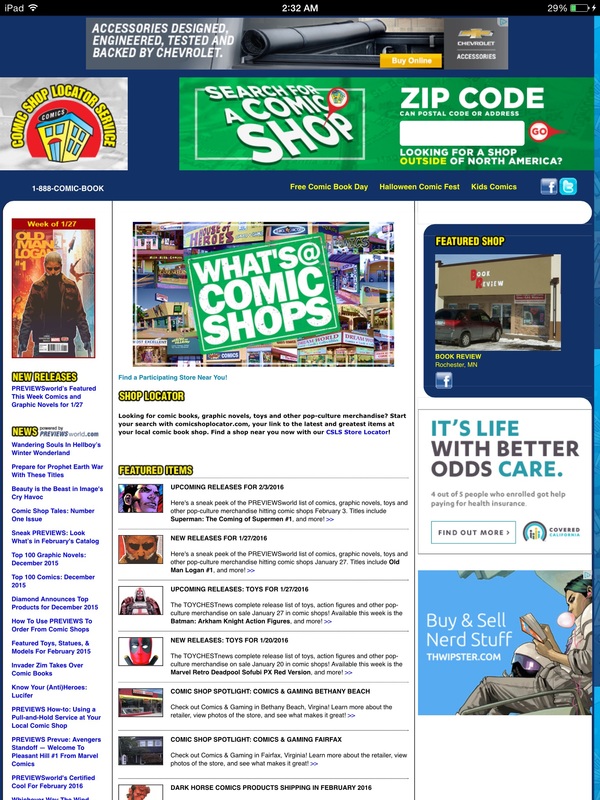 You go to www.comicshoplocator.com, enter your zip code, and a list of the shops nearest to you will pop up. It’s that easy! As I mentioned above, there are some bad apples in the bunch, but 99% of the staff I’ve dealt with at stores have been extremely helpful. Tell them what you’re interested in, and they should be able to help you find exactly what you’re looking for, even if you don’t know exactly what that is. One thing that other means of comic distribution will never be able to replicate is the community feeling of the best stores, and employees knowing what you will like before you do. The professional comic book retailer has been a gift to the industry for years, and the single best tool at a new reader’s disposal. Don’t feel intimidated, and don’t be afraid to ask for help. The good retailers will make time for you, and help nurture a new fan into this wonderful hobby. If you have the luxury of having multiple shops in your area make sure to take the time to explore them, and find the one you like most! If there aren’t any comic book stores in your area, or you don’t like the one that is, you still have options! For whatever reason you are unable to make it to a comic book store to pick up physical copies of comic books, having an Internet connection means that the entire Marvel Universe is always in the palm of your hands (quite literally in most cases). With the proliferation of mobile devices into our society, digital comics have seen a dramatic increase in popularity. 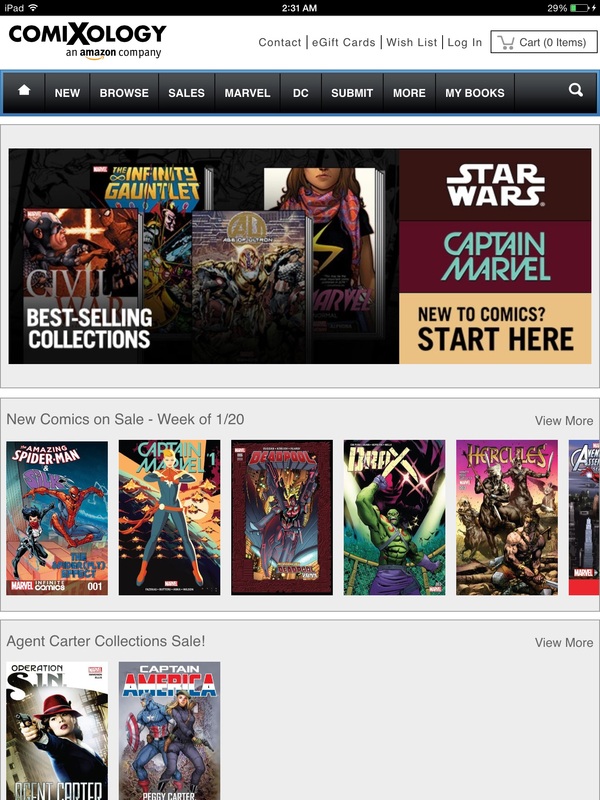 The biggest dealer of digital comics is Comixology. What seems like a majority of the comics ever published by Marvel are available on the site, and new issues are available first thing on Wednesday morning. With an optional subscription system that sees new issues automatically added to your account the day an issue comes out, and product that never sells out, Comixology is arguably the easiest way to read new comics. That’s right, you don’t have to get out of bed in the morning to get new comics to read. To get started, head over to Comixology.com, and sign up for a free account. The official Marvel Digital Comics Shop is also powered by Comixology, and can be found at Comicstore.Marvel.Com. From either website you are able to buy individual comics, and subscribe to complete series. Then you can sync your account across your devices, and read your purchases on the Comixology app available for both iOS, and Android. You can even download issues to your device to read offline. Note: Marvel also has their own digital reading app which you can download on iOS and Android. It works in conjunction with the Marvel Digital Store. I find it much easier to use the main Comixology site, and app if you’re planning on ever trying a comic from another publisher. Digital comics aren’t without their downside though. For many readers nothing will ever beat reading a physical comic book. The look, the feel, and even the smell add up to an unparalled experience. There’s also the fact that brand new comics cost the same for digital copies as they do physical. This is the case despite the lack of printing costs, and the fact that, as of now, you must read your purchased Marvel digital comics on the Comixology or Marvel apps. Whether or not this is a big deal will depend on individual readers, but in a lot of cases the pros outweigh the cons. Quite possibly the biggest pro in reading digital comics is that they don’t take up physical room. You can be a click or two away from hundreds of comics in your collection, all without a single bit of mess in your home. Digital comics didn’t really take off when readers were forced to read them on an odd shaped computer screen. Being able to take your collection on the go with your phone has been a big boon, but the game changer has been the advances in tablet technology. For the first time ever digital readers can claim to have just as good of a reading experience as physical readers, if not better. There will always be room in the hobby for the collector, but digital is great for those that just want to read the stories. 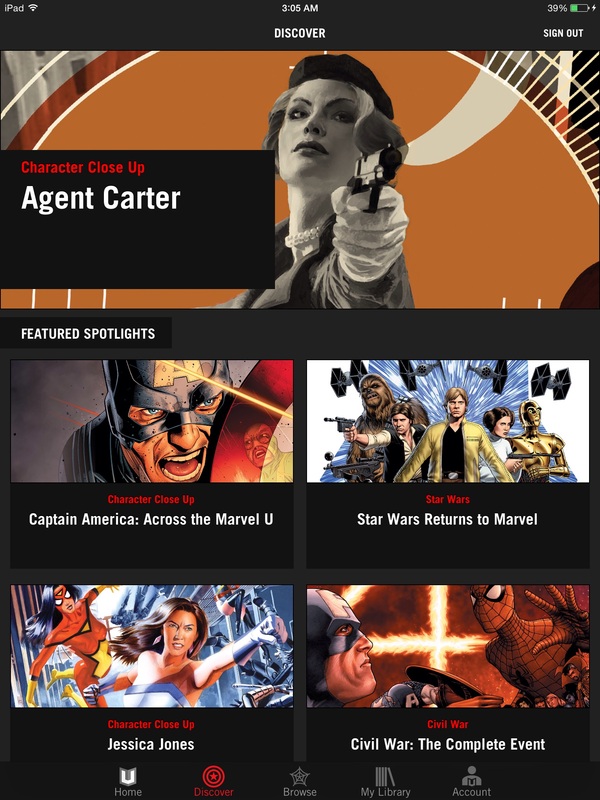 Marvel Comics has changed the game for digital readers with their Marvel Unlimited service. The easiest way to describe it is to call it the “Netflix streaming” of comic books. For as little as $9.99 a month you can digitally access over 17,000 Marvel comics. If you are just getting into the comic books this may be the most logical purchase. You can explore the history of your favorite characters from their first appearances all the way through the modern day. 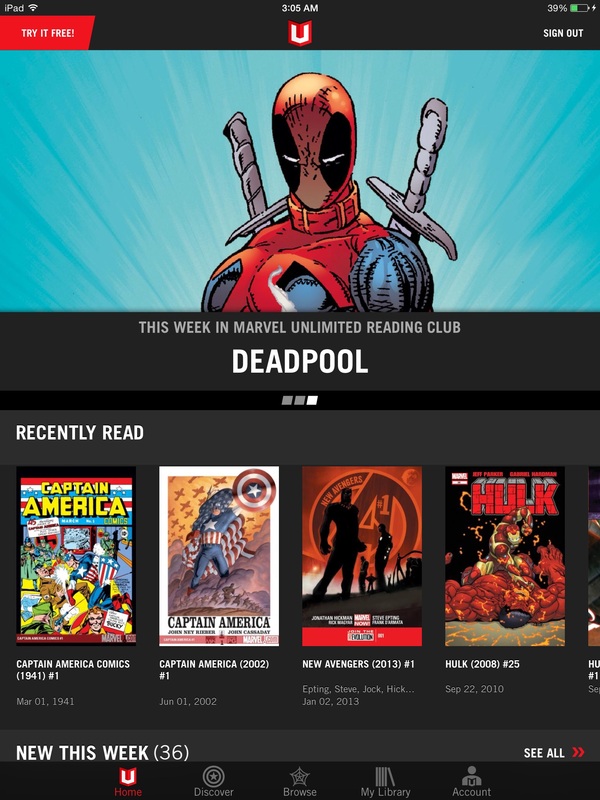 New issues are added every week, but the only downside is that there is a six month gap between new comic releases, and their addition to Marvel Unlimited. If you are looking to jump right in to the brand new stories, this may not be for you. However, if you are looking to explore Marvel’s rich history, and wouldn’t even notice the six month wait, this is the coolest, and most cost effective way to go. To get started you must sign up at Marvel.com/Comics/Unlimited. 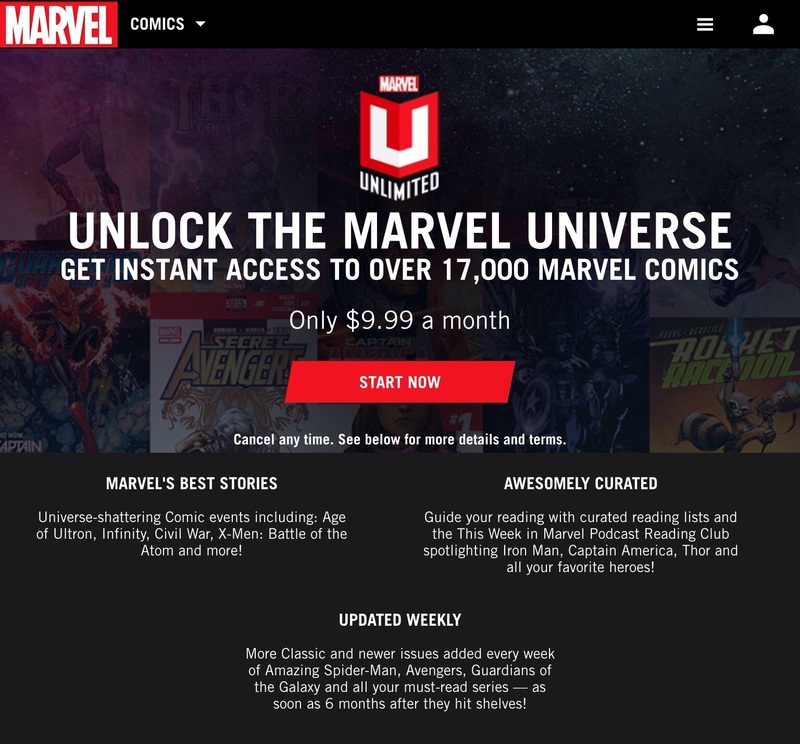 It uses your Marvel.com account, so you may be prompted to sign up for a free account if you don’t have one. After that is taken care of you can choose your plan. If you’re just testing the waters, the $9.99 monthly plan is probably your best bet. The other options are an Annual plan for $69, and an Annual Plus plan for $99. The Annual plan is a great buy, as you save $50 versus paying for it month to month. The Annual Plus plan is a bit pricey, but still ends up being cheaper per month than paying monthly. 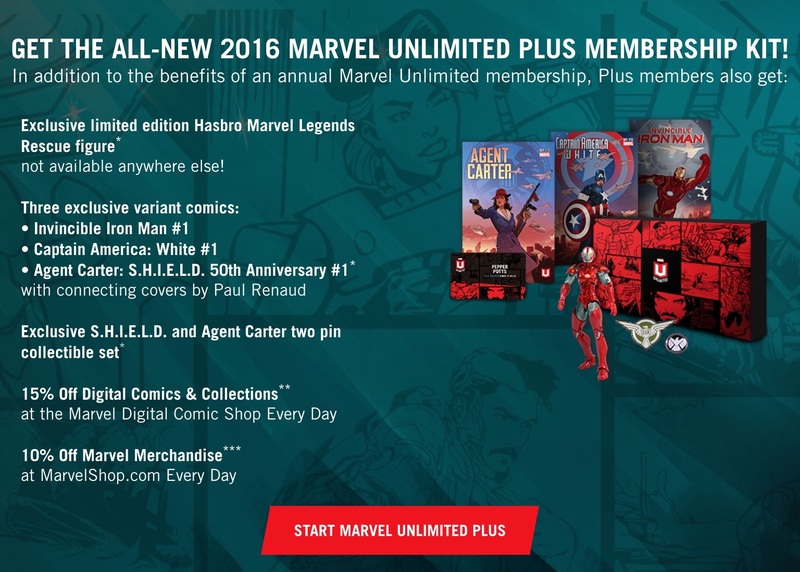 The Plus plan comes with a bunch of extra perks that would excite almost all Marvel fans. You can see the pricing options here below. Also note, the charges are recurring, so you must cancel before your billing date if you’d no longer wish to subscribe to the service. 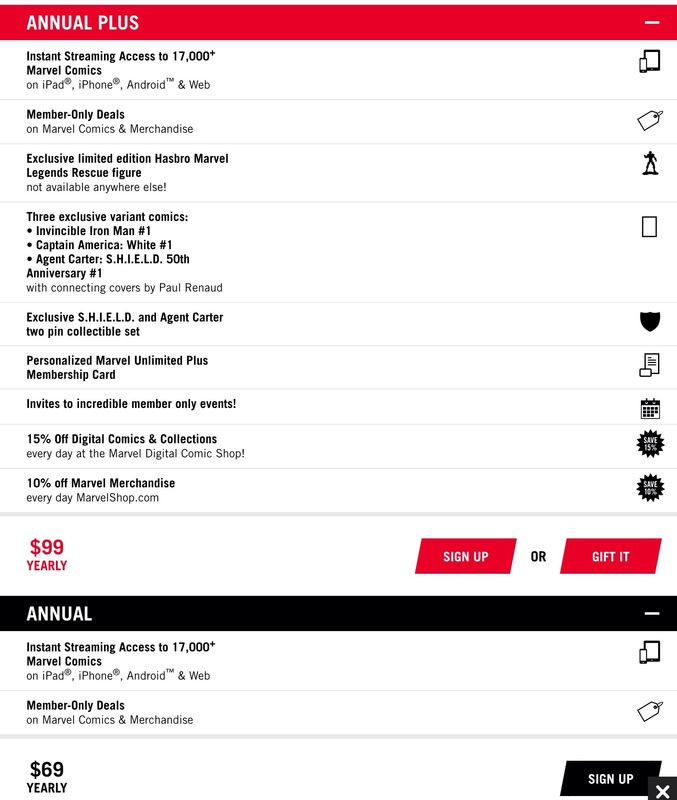 Once you get signed up you can browse the library through the clunky web interface, or download the Marvel Unlimited app on your favorite iOS, or Android device. This app is separate from the Comixology, and Marvel apps. Once you get started, you may find it hard to stop browsing. The team at Marvel has a nicely curated collection that will help new readers dive right in. This includes a weekly book club, and a “Discover” tab that features some of the most important stories from the today’s most popular characters. As great as the service is, there are still a few downsides to Marvel Unlimited. First, there are still holes in the library. Most of the big titles are featured all the way through, but as you dig deeper you may find a random issue, or chunks of a series missing. With new issues being added all of the time this is becoming less of an issue almost daily. Also, given that it’s aimed at all ages means that the MAX adult only titles are unavailable. That means fans of the Netflix shows may be disappointed to find that some of the best Punisher stories, and the comic that Jessica Jones is based off of are unavailable. With that said, new readers will have so much to read on Marvel Unlimited. Given the price point, and curation of material, it is highly recommended for readers getting their feet wet. That was the first ever TMR Comics 101, a rundown of the different ways to buy comics this day and age. I know it was a long read, but hopefully as you begin your journey toward the comics you can keep this page bookmarked, and refer to it as needed. Next time on Comics 101, I will be discussing where a new reader can start reading without feeling lost, and must read stories for each of the Marvel Cinematic Universe’s core Avengers team. Until then, you can always reach out through Twitter where we can be found @TheMarvelReport. Use the hashtag #AskTMR for any Marvel Comics related questions you may have, as they may be answered in a future installment.